Point 9 of Deming’s 14 Points. One that is always attractive to a self describing iconoclast. Barriers must be bad if they prevent the exchange and interaction of ideas, or worse if they lead to optimisation within a subunit that suboptimises the wider system. Deming was thinking of managers such as John Browett. Browett was given charge of Apple’s retail operations and immediately started to cut staff numbers and hours in order to reduce his own budget. However, Apple’s avowed strategy is to foster reputation and brand loyalty through a distinctive, unconventional and delightfully effective Apple Store encounter. My wife is more of an enthusiast for Apple products than I, but I am always wowed by our Store visits. I feel sorry for Browett as he was clearly left to guess the corporation’s strategy. Some organisational functions are just there because they enable the principle value streams. Without them profits would fall. Silo management is the term mockingly used to satirise a management dominated by pillars of functional expertise bolstered by professional status and mute to its “rival” silos. Deming reminded us that somebody in a leadership position does need to maintain a synoptic view of the business system to prevent Browett type misunderstandings. Anybody who has been to a Deming seminar will have seen the Deming system diagram. 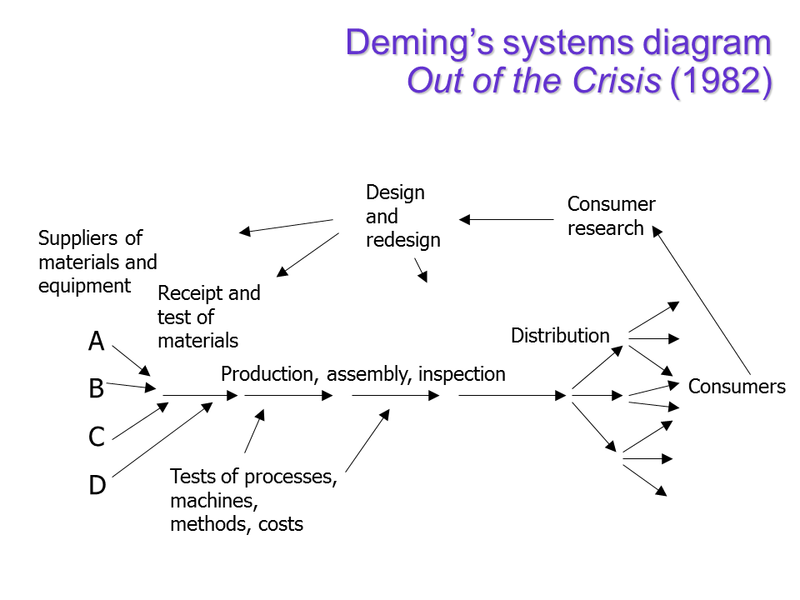 Deming invited participants to focus on the system that created revenues for the organisation and, further, to see that system as a network of processes. Deming used the diagram to emphasis that the critical business processes transect organisational boundaries. Raw materials, whether physical or transactional, run into and out of the silos. Some processes don’t transform the raw materials but act as critical support for the supplier-customer strand. Deming argued that equipment maintenance, product development etc. are nonetheless processes transforming their own inputs into vital enablers and accelerants of the revenue generating activities. Further, held Deming, those processes run across the external boundaries of the organisation into suppliers and customer. A manufacturer making car tyres is part of a bigger picture including the manufacture of the tyre rubber and even the way the end user drives his motor car. Only by understanding the whole can the tyre performance be optimised, customer value maximised, and growing market share and revenues realised. Yet the power of the functions remains and is seldom mitigated by implementing process management. Process management is something with which organisations still struggle.Those who try to follow the idea of dispersing expertise into the processes frequently find that individuals embedded in cross-functional teams perform less well than within their concentrated centres of excellence. It is worth remembering how two counterbalancing forces arise. Any proposed system of reward must be risk assessed against the behaviours it is likely to encourage or discourage. Managers given the job of reducing the cost of running their own silo will do just that. All managers are optimising within their own bounded rationality. One tactic that can help prevent managers from optimising their own subsystem at the expense of the greater is to adopt some system of goal deployment such as hoshin kanri. Visibility, both horizontally and vertically, of how individual results contribute to organisational goals, effected through objective supervision and strategic governance, ought to discourage suboptimisation and reveal any such trends at an early time. In 1776, Scottish philosopher Adam Smith told the parable of the pin maker. Smith set out a detailed argument for the benefits of specialisation and the division of labour. The silos provide the means of rewarding the development of expertise in itself, something whose value may only be seen in the future, and of fostering the application of that expertise in management. Deming was somewhat inimical to this idea and thought that managers should work in a variety of roles across functions as they ascended the hierarchy, as he felt they did in Japan. Yet it is critical in that environment to maintain the virtues of the silos as incubators of expertise. This is not so easily achieved. In The Democratic Corporation (1994) Russell Ackoff asked why we could not make a business out of mutually and severally co-operating individuals, each negotiating a web of personal contracts that made up the system that delivered the goods. Nobel laureate economist Ronald Coase had already answered the question in his 1937 paper The Nature of the Firm. Coase explained why organisations are promoted and employ the people who might otherwise be a market of interacting individual contractors. It simply came down to the costs of operating such a market and the savings that could be made from making a global decision to bring some people and facilities under a single enduring roof. Organisational and even function boundaries often arise from subtle cost structures. Perhaps these develop over time as more connected ways of remote working become commonplace. But it is important to analyse the forces that created and perpetuate the silos. Otherwise, it should be no surprise when the benefits of process management go unrealised.